A milkmaid flower, the first wildflower of the year. Tuesday was mostly clear so I put off house cleaning and took a walk. 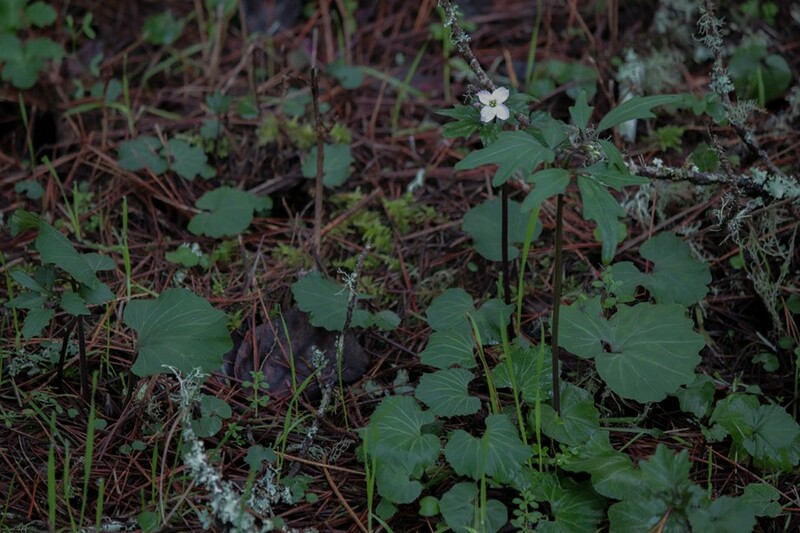 Along the road I saw a few pale lavender colored Milkmaid flowers (Cardamine californica). They are the first wildflower I see every year. Aside from having to extricate myself from quicksand up to my knees, I had a good time taking photos of some bugs in a pond left by receding waters of the Van Duzen River. One tiny, speckled insect swam to where I could barely reach extending my body as far as I could before I blindly clicked the photo. I thought it was a small diving beetle. In the fine silt mud surrounding the puddle were hundreds of strange little tracks. As I gazed into the water, a stick seemed to lurch its way toward the shore. It was making the exact same track. So I inspected and found the “stick” was really a collection of redwood needles and other detritus enveloping a large caddisfly larva. A mystery solved! I saw none of the little variegated meadowhawk dragonflies (Sympetrum corruptum) I have reported to Odonata Central through the last three winters. 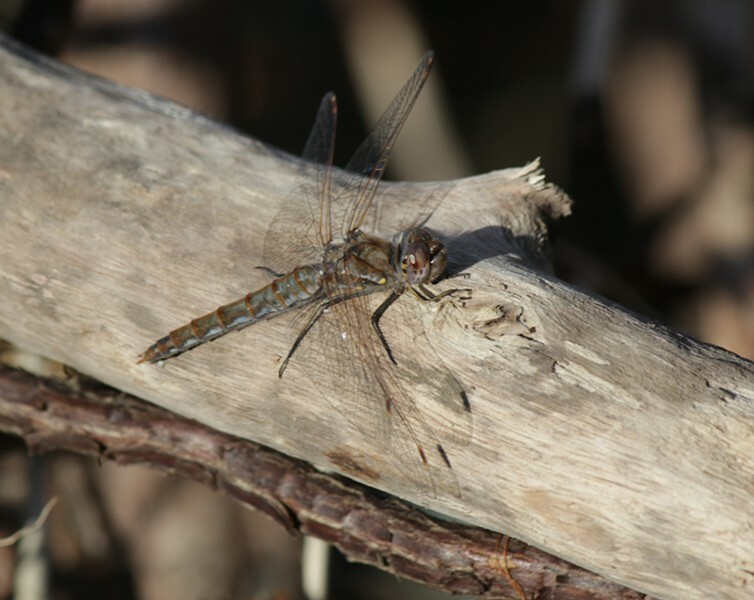 Although one of the most common dragonflies in North America, their behavior of overwintering here is unprecedented, allowing me to be the last person in California to report a dragonfly sighting every year, as well as the first the following year. Wednesday was even nicer, with warm breezes and mostly sunny skies. So once again I put off work and went for my walk. This time I saw and photographed four or five of the little dragonflies, and managed to get shots of dragonfly larvae in the water of the pond I had seen the day before. An online friend identified it as an entirely different species from the adults I had seen. 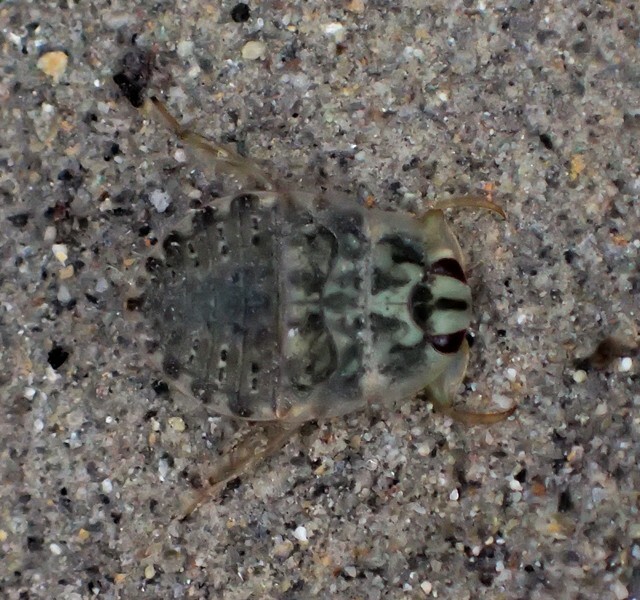 The creeping water bug, a voracious, ¼-inch long baby predator that can grow to over an inch. When I downloaded the photos from the first day, I immediately recognized the insect I had captured in the camera was no beetle, but a member of the order Hemiptera, true bugs. 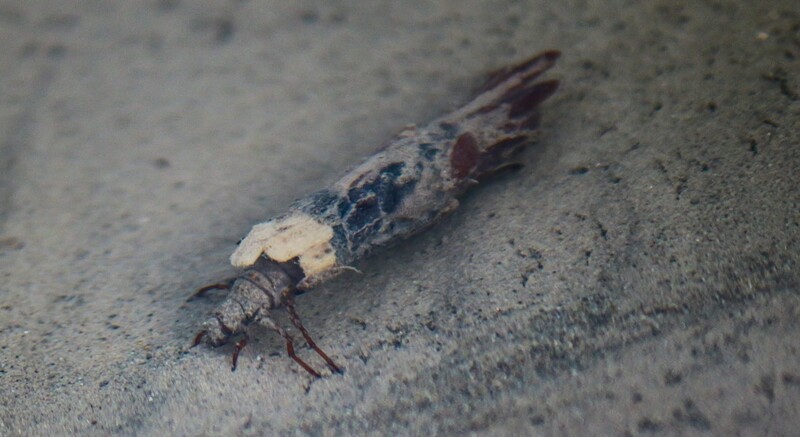 That it was immature was evident, and I thought it resembled a giant water bug, one of my “unicorn species.” (Ones known to exist, but never seen when I have a camera.) I was not 100 percent on the identification, so I posted it online asking if it was what I suspected. I was delighted when one of my Facebook friends corrected my identification. Like the related giant water bug, this creeping water bug (family Naucoridae) grabs its prey with ice-tong front legs and drives a beak into it, injecting a digestive venom. This is an entire family of insects I never knew existed. I have probably taken the same walk over 300 times, and every single time I see something interesting or new.